Arizona attempted to illegally obtain execution drugs, which were seized at the Phoenix airport. 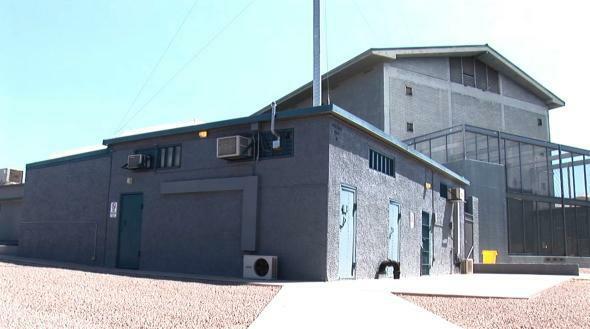 The execution chamber at the Arizona State Prison Complex in Florence, Arizona. Federal authorities at the Phoenix International Airport seized a July shipment of an illegally obtained drug that the state of Arizona intended to use to execute prisoners, the AP reports. The substance at issue is sodium thiopental, which is used as an anesthetic in multidrug lethal injection “cocktails,” and Arizona apparently purchased $27,000 of the drug from a supplier that is not approved by the Food and Drug Administration. The Arizona Department of Corrections is “contesting FDA’s legal authority to continue to withhold the state’s execution chemicals,” a spokesman said. Arizona is one of a number of states that have had problems obtaining lethal injection drugs in recent years as pharmacists both in the United States and abroad have decided for ethical reasons to stop supplying them. Oklahoma recently admitted that it had actually used the wrong drug altogether to kill a prisoner in January; Louisiana may have violated laws last year by getting lethal injection drugs from a hospital without informing the hospital the drug might be used to kill someone; Nebraska is trying to buy drugs from an unauthorized supplier in India. Executions in Arizona have been suspended since July 2014 after the killing of a prisoner named Joseph Wood took 90 minutes to carry out and required the administration of 15 doses of of a drug cocktail that was expected to kill him with one dose.